Don't get caught off guard when vehicles approach your home or business. Perfect for protecting driveways, drive-thru, service centres, farms and property entrances. The Dakota Alert DCPA4000 driveway alarm system uses a magnetic probe that senses the change in the magnetic field caused by large moving metal objects like cars, trucks and heavy equipment. The magnetic vehicle probe is buried alongside or under the driveway, and a wire is run to the wireless transmitter that can mount on a wall, tree or pole. When a vehicle drives through the detection area, the wireless transmitter will send a signal to the receiver which will play a sound and light up the LED indicator light. 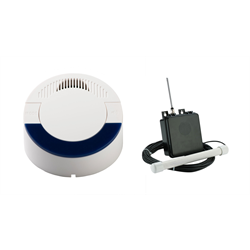 The DCPA4000 has a long wireless range of up to 1 mile (4000 feet)* from the transmitter to the receiver.